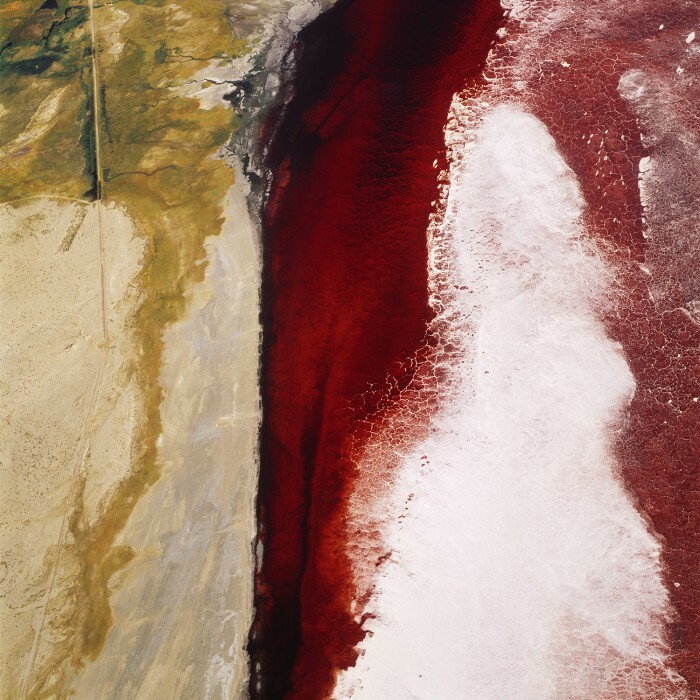 Like all of his work, there’s something disquieting about David Maisel’s The Lake Project. Even as supersaturated fields of reds, greens, and blues crossed by organic patterns and regular geometries seduce us, we wonder what we are looking at. This ontological ghost—just what is it that we are looking at—has always haunted art. At its beginnings in the caves of Chauvet-Pont-d’Arc and Lascaux, we are faced with questions: Are these works made by individuals with consciousness? Do they represent reality? Are they works of art or some other kind of artifact? What, in other words, is their status? At the dawn of modern art, confronted by the twin specters of Malevich’s Black Square and Duchamp’s Fountain, together with their respective legacies of nonobjective painting and conceptualism, again we ask if this work is art. That continual process is art acting as nothing less than a primal form of philosophy, caught up in self-definition. As Hegel suggested, art is the point at which we, and by extension the world, first become self-aware.1 In contemplating a work such as The Lake Project, we reflect on nothing less than the reality of the world, our perception of it, even our existence. What we have at hand, however, is not just any art, but photography. Until recently, whether photography was art at all was a matter of debate, which was generally settled with an agreement that it was not. To take a personal example, about twenty years ago, my father, who was an abstract painter, and I were talking about photography. He dismissed it, with a derisive laugh, saying, “It’s not art, after all, anyone can take a photograph—just point and shoot.” The photograph is a direct product of photons striking a light sensitive plate, film, or sensor and is, as André Bazin writes, “formed automatically, without the creative intervention of man.” Whereas, Bazin continues, the other arts “are based on the presence of man, only photography derives an advantage from his absence.” Photography’s advantage, he continues, is that it promises truth, its indexical nature proving it is real, objective, acceptable as evidence. In this, Bazin concludes, photography’s power is “to lay bare realities. . . . Simultaneously a liberation and a fulfillment, it has freed Western painting, once and for all, from its obsession with realism and allowed it to recover its aesthetic autonomy.”2 Bazin’s argument is a ruse, however, for he inverts this discursus on photography so he can declare that cinema has a language. But Bazin’s reading of the ontology of the photograph also sums up the classic modernist attitude toward the photograph: under modernism, photography was a mere supplement to painting, its photochemical processes liberating painting from the chains of mimesis so it could pursue first the representation of perception and then entirely nonobjective form. But Maisel’s photographs do not fit Fried’s mold; the work the critic champions is not just salon-sized, it makes direct allusions to the salon painting, to the tableau (for example, Wall), portrait (Sherman), and landscape (Gursky). Although size-wise, The Lake Project is intended at least as much for the wall as for the book, it eschews the genres Fried cites. Instead, taken as form, it seems more aligned with traditions of abstract painting. The lurid colors of Gerhard Richter’s pulled-paint works, the color fields of Richard Diebenkorn’s abstract aerial landscapes, and the swirling fluids of Keith Tyson’s “Nature Paintings” come to mind (see figure 1, page 91). But investigating The Lake Project as painting is limiting. To return to Fried, the works he cites depend on a precisely located observer and a notion of place, but here there is no way to find one’s bearings. Is one at three hundred feet feet? At ten thousand? Where is the horizon line? At times, the photographs seem improbably shot straight down, at other times, obliquely taken with respect to the earth. Often, we fail to map our position entirely. Taking the photographs together, it becomes easy to see how a pilot without a functioning altimeter could quickly become disoriented and auger into the desert below. Moreover, it’s not just that we lack landmarks in The Lake Project; the terrain itself seems otherworldly, outside of any comprehendible human experience. Maisel’s photographs also recall the infinite extensibility of Mondrian’s; his framing suggests incompleteness, that what we are viewing is an arbitrary sample, part of a larger survey. Sequences don’t naturally arise in Maisel’s series, with features extending beyond the edges; indeed, the images can appear as the operations of a robot probe. In one respect Maisel’s photographs are even more automatic than those of a NASA probe: the brilliant colors in agency photographs are often the product of enhancement (see figure 2, above). Nowhere is this more evident than in images produced by Landsat, a long-running series of earth-sensing satellites, which ascribe exaggerated or “false” colors to parts of the spectrum otherwise indiscernible to the eye. Volition and seemingly automatic imagery, it appears, can’t so easily be pulled apart. As surveyors of distant worlds, NASA’s spacecraft have taken part in a long history of photographs documenting the frontier. The subject of The Lake Project, Owens Lake, California, is nestled on the east side of the Sierra Nevada mountains, one of the areas that received the most attention from such surveys. With the frontier expanding westward across the Plains states and then eastward from the California coast, the Sierras became an immovable obstacle, risky to get across but also compelling for photographers like Carleton Watkins and Eadweard Muybridge, who were captivated by Yosemite Valley and the mountains surrounding it. The first record we have of the Owens Valley is that of frontiersman Joseph Reddeford Walker, who visited it in 1834 and unfavorably compared it to the lusher San Joaquin Valley on the other side of the Sierras. In 1845 Lieutenant John C. Frémont of the US Army Corps of Topographical Engineers led his third expedition to the Western frontier, accompanied by Walker, and mapped the valley for the first time. Frémont named the valley, river, and lake after Richard Owens, a member of his expedition. After gold and silver were discovered in the surrounding mountains, settlers began to migrate to the area; in under a decade, ranching and mining were flourishing. The California State Geological Survey passed through in 1864, documenting the area and naming Mount Whitney after the state geologist, Josiah D. Whitney. With the success of Whitney’s own Yosemite Book (1868), which accompanied his survey of Yosemite with Watkins’s photographs, expedition leaders began to employ photographers. A second corps expedition, this time led by Lieutenant George M. Wheeler, passed through in 1871 heading south from Fort Halleck, Nevada, to the lower Colorado River in the Grand Canyon. Wheeler brought with him photographer Timothy O’Sullivan and gave him a major role in the expedition, appointing him “executive-in-charge.” Although O’Sullivan produced some photographs of the Owens Valley, his focus there was largely on the mining camps and alpine vistas of the Sierras. The Owens Valley is the deepest valley in the United States, and its relatively wide, flat bottom makes it less compelling than the shallower but narrower Yosemite and Grand Canyon. Notwithstanding the valley’s stark beauty, it lacks any particularly unique features and, given that it was already beginning to be settled by the time O’Sullivan made his way through it, the photographer didn’t seem compelled by it.6 The Owens Valley would never be extensively documented photographically. By the 1870s, large-scale irrigation to feed local ranches began to lower the level of Owens Lake. As the mines exhausted their ore, the valley began to face hard times, which were ameliorated somewhat by a small boom at the beginning of the century based on rising prices in agriculture and renewed mining interests. But with the growing city of Los Angeles facing a water shortage, the Valley’s future took a fateful turn. William Mulholland, the city’s famed superintendent of the Department of Water and Power, came to the valley and identified the Owens River as the city’s next source of water. Buying up water rights, the city built a 233-mile aqueduct to connect the Owens River to the city.8 By 1928, the 108-square-mile lake had dried up, and the alkali dust from the lakebed began to blanket the valley in massive dust storms. Even though companies began to extract salts and other minerals from the lakebed, this did little to help matters. It took the significant loss of water in the visually more impressive Mono Lake at the north end of the valley in the postwar years, coupled with the growing strength of the environmental movement in the mid-1970s, for the damage the city was doing to receive broader public attention.10 This attention was aided in 1975 when the navy identified the dust storms as interfering with operations at the nearby China Lake Naval Air Base, a key testing ground for top-secret naval aircraft and thus a critical facility for national security.11 In 1987, the Environmental Protection Agency designated Owens Lake as being in violation of federal clean-air standards for PM10 dust—particulate matter smaller than ten microns in diameter and among the most harmful type of air pollution—and would later estimate it as the single largest point source pollution of such dust in the country. Under California law, that made it possible for the Great Basin Unified Air Pollution Control District to order Los Angeles to mitigate the dust. Only in 1998, however, would the DWP and the district finally agree on what measures to take to abate the dust storms and how much of the lakebed to treat. There is little question that Maisel documents a landscape of human-made devastation in The Lake Project, much as he has in The Forest and The Mining Project. And yet, it is possible to discuss this work in a disinterested, Kantian sense, without reference to the subject matter. Doing so is not committing violence to the work; on the contrary, it’s what the work encourages us to do. The Lake Project is both beautiful and disturbing at the same time. It reminds us that there can be another reading of Walter Benjamin’s thesis that “there is no document of civilization which is not at the same time a document of barbarism.” For if Benjamin means that cultural treasures are spoils, the products of surplus wealth produced by the “anonymous toil of their contemporaries,” in heeding his call to “read history against the grain” we have to acknowledge the impossibility of disentangling ourselves from the pleasure that those cultural spoils brought Benjamin and bring us.14 The Lake Project reveals nothing less than our own complicity, and art’s complicity, in barbarism. In this, The Lake Project recalls the precedent of photographer William Garnett. Commissioned to document the conversion of thirty-five hundred acres of beet fields into the Los Angeles suburb of Lakewood Park by the suburb’s developers, Garnett produced a set of compelling images, initially bound into a presentation book. The press initially took up the photographs as a record of postwar progress, but a decade later they had become identified as records of the mechanical destruction of the environment in service of the banality of sprawl.15 In 1969, Garnett would collaborate with Nathaniel Owings, the retired founding partner of Skidmore Owings and Merrill by lending his aerial photographs to The American Aesthetic, a late modern plea for density and concern for the environment. The response, Baltz writes, is to “simply level the camera, point it at the horizon, make a photograph, turn it so many degrees, make another, and so forth.” Any formal qualities become an accidental property of the landscape itself, a condition that Baltz suggests parallels the orbital photographs of Mars taken by NASA’s Viking spacecraft, cementing the suggestion that such surveys inescapably bring up the authorless photographs of the space probes.18 Ed Ruscha’s Every Building on the Sunset Strip comes to mind as well; in this case the photographer (in anticipation of Google Street View) used a motorized Nikon mounted on the back of his pickup truck. Facing damaged landscapes, we become automata. Didion’s evocation of a “vast emptiness” in the West also resonates with William Everson’s ideas in Archetype West: The Pacific Coast as a Literary Region. For Everson, a former Dominican priest, the literature of the Western states is dominated by subjectivity that reaches a turning point in John Muir’s writing. Muir, he explains, understands God as being found in nature, not in man. But it is only in the destruction of that nature, in the damming of Hetch Hetchy valley by San Francisco, that the archetype can move forward when Muir writes, “Dam Hetch Hetchy? As well dam for watertanks the people’s cathedrals and churches, for no holier temple ever existed in the heart of man.”19 Everson continues, suggesting that in poet Robinson Jeffers the key to archetype is revealed, taking place in bloody violence. Jeffers, Everson concludes, “is the sunset in the West. It is bloody and violent, but it is the last light given to us. We deny it at our peril.”20 Faced with landscape of an unprecedented scale—and its destruction—Everson explains, we are forced to confront the mark we leave on our habitat as the central fact of human existence.21 In doing so, however, the subject is annihilated. Only then can the difference between the individual and the surroundings can be overcome. The leveling of the camera that Baltz refers to is the photographic manifestation of the annihilation of the Western self. But, here we are back our starting point. For there is also little question that in Maisel, as in Baltz, photography is no accident but rather is deliberately composed. Confronting such work, we face that self-reflexivity at the heart of art and, by extension, humanity. Of The Lake Project, Maisel himself suggests, “If death is the mother of beauty, as the poet Wallace Stevens said, then these images may serve as the lake’s autopsy,” and “With camera lens trained on the dead lake, its skin was peeled back, the exquisite corpse revealed” (page 123). It’s not enough to simply mitigate the dust from the dry surface of Owens Lake; rather, these photographs suggest that its death must be seared into our very being. Comparing The Lake Project to NASA’s photographs of Mars—a dead planet that may have once been as alive as the Earth, its water, any possible life, and soil stripped away—we see in both cases the vivid colors produced by the actions of chemicals and mechanical wear. We are led to wonder if we are looking at the future of the Earth, after its destruction by humans. Is the planet’s fate to follow that of historical Eden itself, the now-desertified Tigris-Euphrates Valley? Is the Fall really an allegory for the destruction of nature? Pondering The Lake Project, we understand this, and as we do, we see that we are not only inseparable from nature but that our destruction of nature is inseparable from nature as well. Gazing at the toxic colors of these landscapes, we see ourselves. (New York: Oxford University Press, 1998). 2 André Bazin, What is Cinema? Vol. I (Berkeley: University of California Press, 2004), 13–16. 3 Michael Fried, Why Photography Matters as Art as Never Before (New Haven, CT: Yale University Press, 2008). 4 Jeff Wall in Pictures of Architecture / Architecture of Pictures: A Conversation between Jacques Herzog and Jeff Wall, moderated by Philip Ursprung (Vienna: Springer, 2004), 53. 5 See Aaron Scharf, Art and Photography (New York: Penguin, 1967), 294–97. 6 For more on O’Sullivan, see Toby Jurovics, ed., Framing the West: The Survey Photographs of Timothy H. O’Sullivan (New Haven, CT: Yale University Press, 2010). 7 William Cronon, “Revisiting the Vanishing Frontier: The Legacy of Frederick Jackson Turner,” The Western Historical Quarterly 18, no. 2 (April 1987), 173, 167. 8 John Walton, Western Times and Water Wars: State, Culture, and Rebellion in California (Berkeley: University of California Press, 1992), 55–89 and 121–97. 9 Marith C. Reheis, US Geological Survey, “Dust deposition downwind of Owens (dry) Lake, 1991-1994: Preliminary findings,” Journal of Geophysical Research 102 (1997): 25,999–26,008. On PM10 pollutants, see Great Basin Unified Air Pollution Control District, “Particulate Matter Air Pollution: A Threat To Our Health,” http://www.gbuapcd.org/pm10.htm and “Overview of Great Basin Air Pollution Control District Air Quality Plans,” http://www.gbuapcd.org/airqualityplans.htm. See also Karen Piper, Left in the Dust: How Race and Politics Created a Human and Environmental Tragedy in L. A. (New York: Palgrave Macmillan, 2006). 10 John Hart, Storm Over Mono: The Mono Lake Battle and the California Water Future (Berkeley: University of California Press, 1996). 12 US Environmental Protection Agency, “Owens Valley, CA Particulate Matter Plan: History,” http://www.epa.gov/region9/air/owens/history.html. 13 Mike Gervais, “DWP, Great Basin at Odds Over Owens Lake Dust Work,” The Inyo Register (February 22, 2012), http://inyoregister.com/node/2353. On the history of Owens Lake and Valley and the efforts of the city to remediate, see also Barry Lehrman “Reconstructing the Void,” in The Infrastructural City, ed. Kazys Varnelis (Barcelona: Actar, 2008), 21–33. 14 Walter Benjamin, “Theses on the Philosophy of History,” in Illuminations: Essays and Reflections (New York: Schocken Books, 1970), 256. 15 Alex Ward Rome, The Bulldozer in the Countryside: Suburban Sprawl and the American Environmentalism (New York: Cambridge University Press, 2001), 1–3. 16 Britt Salvesen, “New Topographics,” in New Topographics. (Tucson: Center for Creative Photography, University of Arizona, 2010), 42. 17 Lewis Baltz in Baltz, et. al. Landscape: Theory (Lustrum Press, 1980), 25. The original review by Joan Didion is “I Want to Go Ahead and Do It. The Executioner’s Song By Norman Mailer,” The New York Times, October 7, 1979, http://www.nytimes.com/books/97/05/04/reviews/mailer-song.html. 19 William Everson, Archetype West (Berkeley: Oyez, 1976), 50–53.